Recently I had the opportunity to sit down and speak with Cyrus Anvari, the sales manager for Elite Residences about their exciting projects around Old Town Lewisville. Did you know Elite Residences has 5 projects currently underway in Lewisville’s Old Town District? Yes, that’s right – FIVE! The range of properties is across the spectrum, from townhomes, to condo-mixed use, to single family residences from single to three stories. The communities range in price points from the $210,000's into the upper $300,000's+, making these projects affordable to alot of folks seeking newly built homes in a range of property styles. One of the most visible communities in Old Town are the South Village residences. These are New England style single-family patio homes that are in the heart of Old Town. These homes feature 3 stories, 3 bedrooms, 3 and a half baths, and begin around 1890ish square feet, are smart home enabled with Amazon Alexa, and come in 4 floorplans as showcased on the website. Each of the floorplans shows a 2 car garage and features a first floor bedroom which have been utilized in a variety of ways at similar developments in Uptown including an office, library, or play room. Balcony spaces add aesthetic interest, including full and Juliet options. In all there will be around 63 residences ranging up to the $340,000's at this time. Two floorplans will be available in the next 60 days. Build times are roughly 120-160 days. Currently there is not a model home available to view. Nearing completion, this townhome project off South Kealy comes smart home enabled with Amazon Alexa, has 2 floorplan options, 3 bedrooms, 3 and a half baths, 2 stories, a 2 car garage, and convenient lower maintenance lifestyle. Finish out includes neutral tones, granite, stainless steal appliances, and the option has been available for thicker baseboards adding a craftsman feel! The half-bath downstairs is great for entertaining and upstairs in the interior unit's floorplan there is a bonus loft space that can be utilized for a reading nook, play area, television spot, or small office. In the future there will be a swimming pool for residents to enjoy as well, a feature other townhome communities nearby don't have. Prices begin around $304,500 and have builder incentives. Several of these residences have been purchased by investors and are available for lease around $1850 per month (pricing varies by property so contact Audra for current MLS inventories). Currently there is one interior unit available at $295,000 plus bonus builder incentives available. The red brick finish on this property really makes a statement off Mill Street! As a mixed use development, this property will showcase commercial on the first floor and residences on the second and third floors. Second floor units will begin around $210,000, be around 1700 square feet with 2 bedrooms and 2 baths and a two car garage. Top floor units will be much the same as the second floor, but feature two assigned uncovered parking spaces. The stunning top floor views put these units at $219,000 starting. This property is also going to be Amazon Alexa enabled. Highly anticipated, the Brownstones On Walters are the latest project to take shape in Old Town and truly are something special! Though no model is available, units have already gone under contract! Corner units begin at around $319,000 and interior units are around $309,900, but anticipate those prices to go up as demand heats up. Units feature a 2 car garage, 1900 square feet, 3 bedrooms, 3.5 baths, and will be 3 stories in total. Overlooking City Hall, one would be hard pressed at this point to find a residences closer to the heart of town! The residences are truly special to Elite Residences, with upgrades galore as noted in their specs sheet, including: custom kitchen cabinetry, designer ceramic tiles in baths, engineered hardwoods, energy star stainless steal Whirlpool appliances, upgraded fixtures, optional secondary master shower, optional dual vanities, fully landscaped and irrigated by HOA, HOA blanket insurance including for roof, full bath in each bedroom, and a half bath off the main living room for entertaining. Dirt is taking shape off Kealy for the Legacy Point Lewisville single family development. Though details are sparse, I did get a chance to ask Cyrus about this development in the works. There will be 90 single family homes which will feature single story options! Price points at this point are anticipated to begin at $379,900 and feature 2200 square feet and above. A homeowners association will be incorporated into the neighborhood as well. More information is expected to come soon! Special thanks to Cyrus and the folks at Elite Residences! 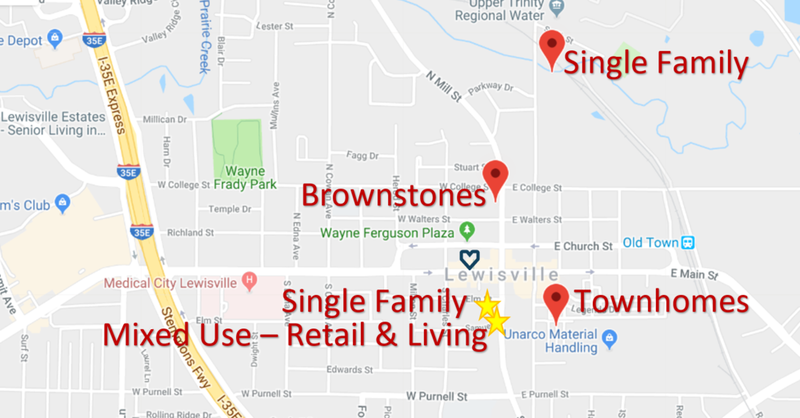 We look forward to seeing these homes filled with fabulous Lewisville residents! Information in this blog were largely obtained from the website. Prices, build out details, community information, and all information contained us subject to change for a variety of reasons. To learn more visit Elite Residence's website.